I had introduced to my readers on Singapore's Pek Sin Choon teashop in my previous blog entry. "Renowned Unknown Fragrance is a locally blended traditional tea. When the founder, Bai Jin Ou, was naming the tea, he found that he just can’t describe the fragrance in words and thus the renowned unknown fragrance became the rightful name for the tea. 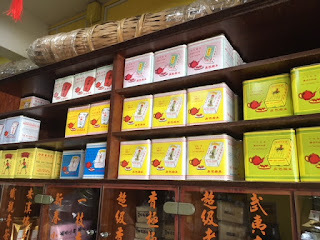 Because of its uniqueness in taste, this tea has been unsurpassed in the Bak Kut Teh (pork rib soup) segment. The tea soup is dark red in colour which is luscious at first sip and produce great aftertaste. Due to its unique mix of tea species, the tea is good for slimming, reducing blood pressure, reducing blood sugar, reducing cholesterol, anti-aging." This tea comes packed in a tin of 50 packets. Each packet is individually hand-wrapped at the shop. Each packet weights about 16g. 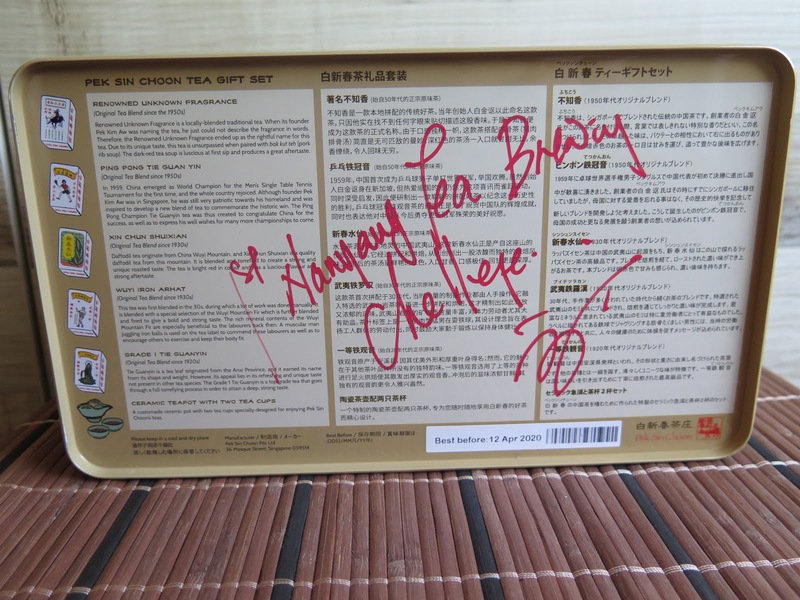 Notice 2 pieces of paper (pink paper inside) used to wrap the tea. I was told that this was a blend of Wuyi and Anxi oolong. 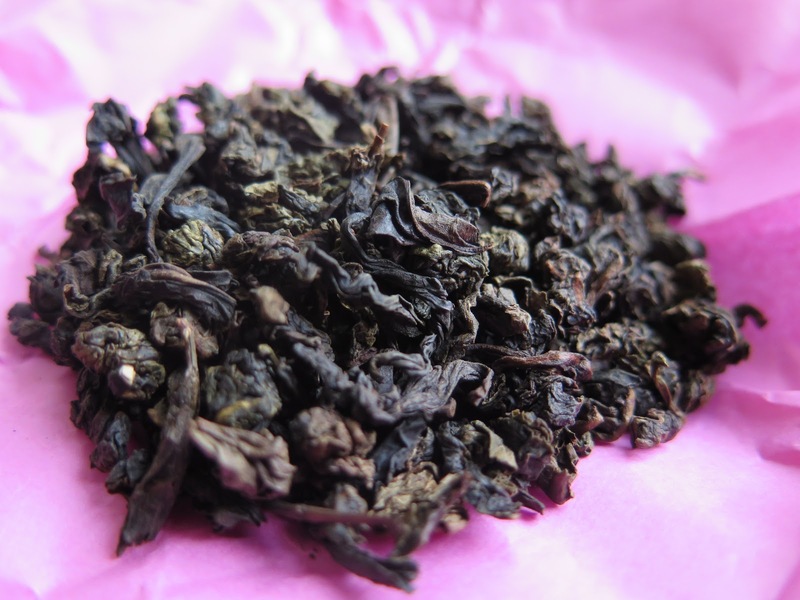 This would explained the appearance of the tea leaves; rolled Anxi leaves and straight Wuyi leaves. I was told that this blend used premium tea leaves and it was about 2-3 times the price of regular oolong tea even when this tea was introduced in to the tea market about 60 years ago. This 'Unknown Fragrance' (also known in the hokkien dialect as 'Put Tee Hiong Tea') is very aromatic. I enjoy the bouquet of floral notes and the lightly sweet finish. An interesting and refreshing tea. You will think that you are in a time capsule when you enter Pek Sin Choon tea shop. Chinese tea are still hand wrapped in small paper packets and sold in aluminium 'biscuit' tins. This Singapore tea shop, established in 1925, with their famous 'shepherd boy on buffalo' logo has been selling tea to tea drinkers and eating establishments for more than 90 years. 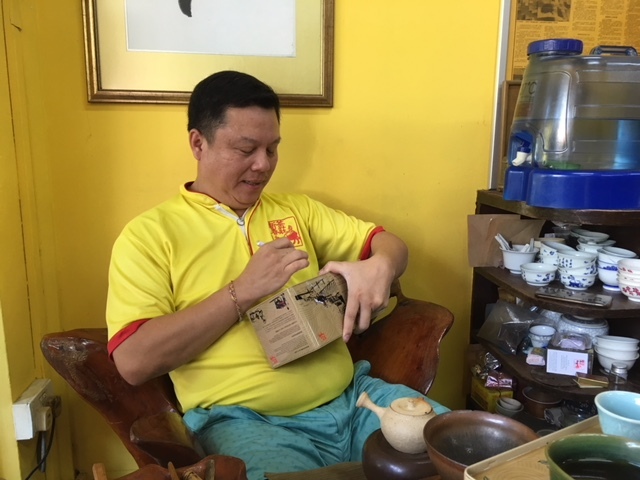 Now managed by the 4th generation, Kenry Pek runs this tea business faithfully keeping to the traditional methods of blending and packaging the tea. Pek Sin Choon has recently produced a commemorative tea box to showcase the company's history of producing Chinese tea. 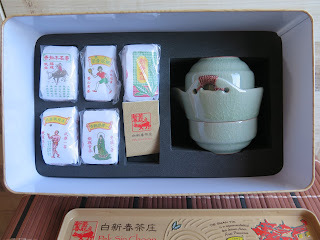 This metal tea box come with 5 of their famous hand wrapped teas and a specially made gaiwan with 2 cups. Notice the 'shepherd boy on buffalo' on the cover of the gaiwan. 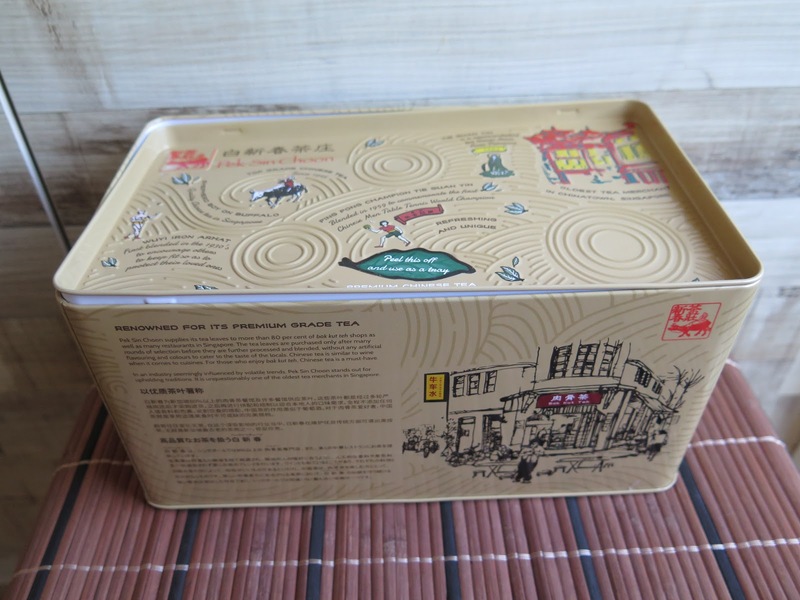 The box has an incision on the cover that allow the tea box to be used as a mini tea tray or small saving coin bank. Information on the box detailed the history of their teas. The table tennis, aka ping pong tie guan yin wrapper was designed in 1959 to congratulate China winning the World Champion Men's Table Tennis for the 1st time. Kenry told me that his family was pretty patriotic at that time. 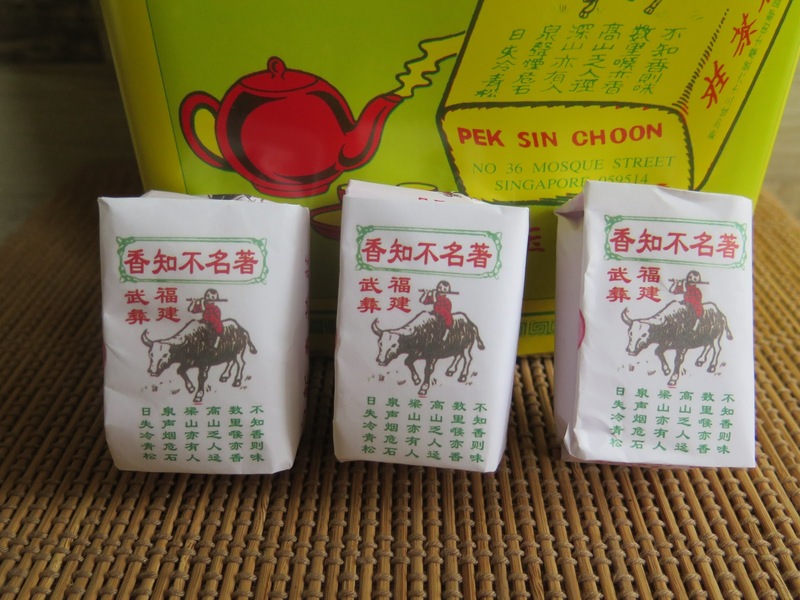 For the tea drinker and collector, make a point to visit Pek Sin Choon tea shop. Located in Chinatown - 36 Mosque Street. Own a piece of Singapore tea history by getting the metal gift box. 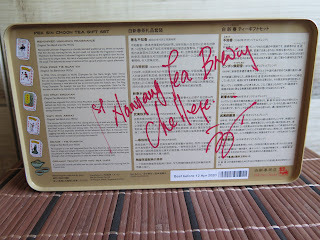 I got mine signed by Kenry. 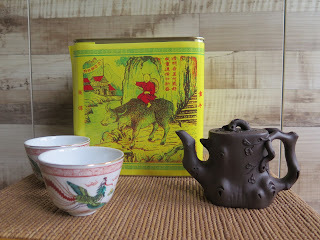 Do remember to purchase a tin of tea and savour every drop of nostalgia when you brew up a cup of tea. 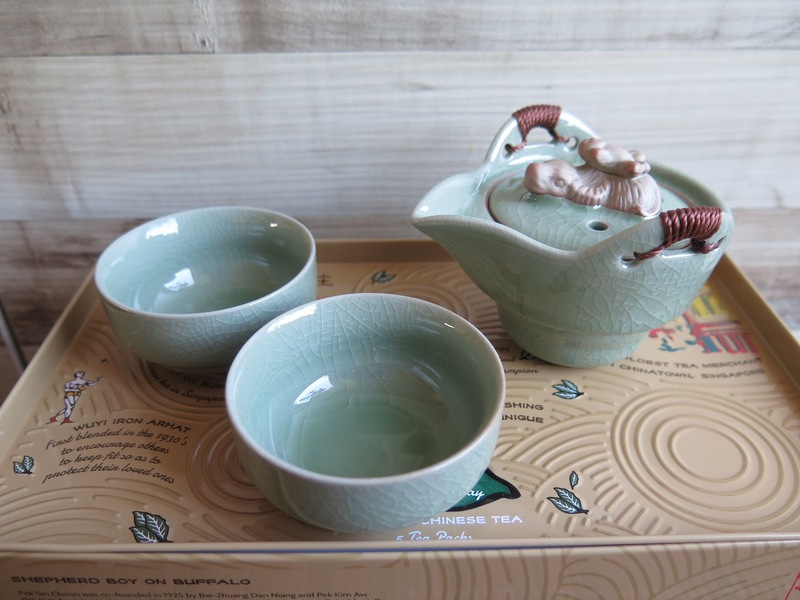 And....Happy Mother's Day to all Chinese Tea drinking mums. 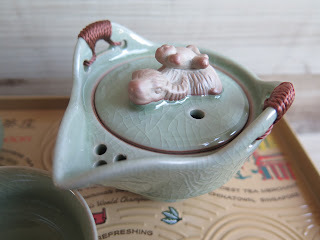 Remember this Ba Jiao Ting I had blogged in Nov last year (link). I had noticed that there was significant tea staining on the tea wrapper. I examined the wrapper and found that these tea stains were dry. The surface of the tea cake was normal. There was nothing extraordinary that I observed about appearance of the the tea cake. I had initially thought that these tea stains was due to water damage. 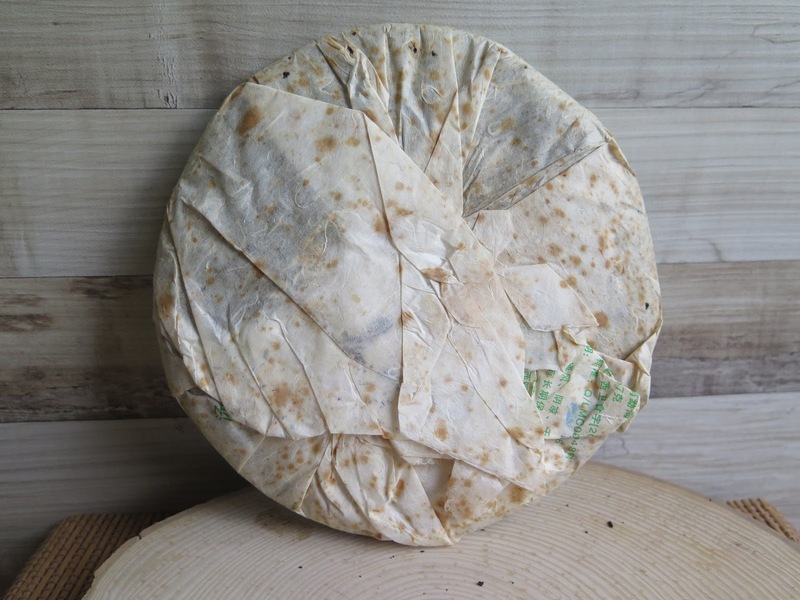 This might be due to the production process, that the cakes were not fully dried out and wrapped causing the stains. I had also thought that storage of the tea could be another factor, that the storage facility was damp. 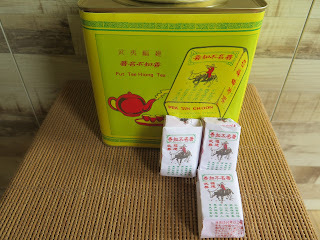 Checking with my supplier of this Ba Jiao Ting, it seems that this was the only tea that had these tea stains. I was in Guangzhou last March, and I asked out this 'tea stain on wrapper' with my tea dealer friends. 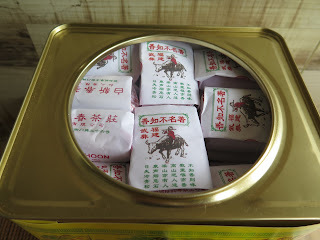 A Chen Zhen Hao (famous for Banzhang) told me that there were many teas, across many brands, that has this 'tea stain on wrapper' phenomena for 2010 batches. Even the zodiac series of the Chen Zhen Hao had this tea stain issue. This tea dealer told me that it was possible there was a change in weather just prior to the pu erh tea harvest. It could have been very cold or hot, causing the pu erh tree to retain more 'tea oil' in the leaves. 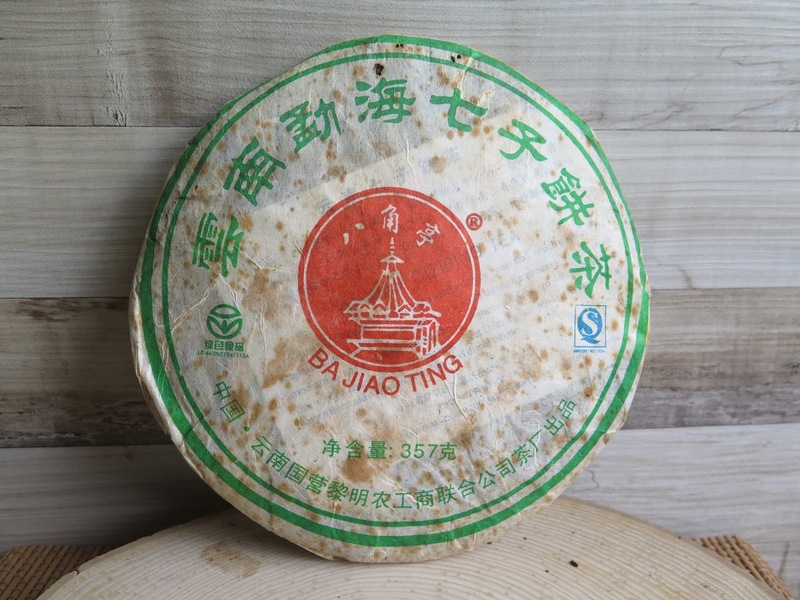 The stains on the tea wrapper were actually tea oil and will not affect the pu erh tea in any way, except for the slight ugly appearance on the wrapper. 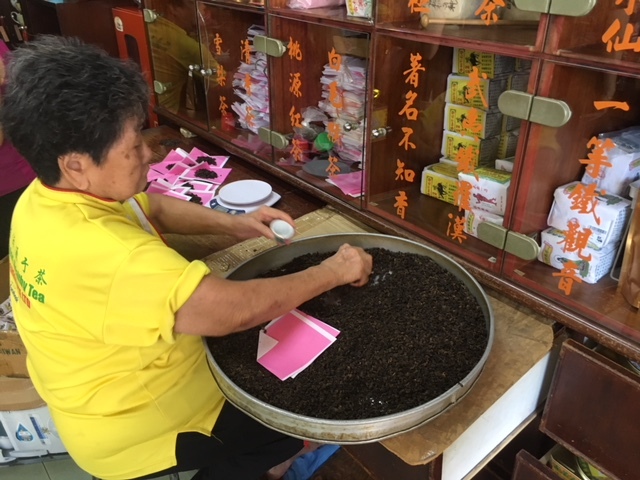 A retired tea production manger in a tea drinking group in Guangzhou told me that some old pu erh tea, that had this phenomena..... the wrappers are now full with holes. He said there was nothing wrong with the tea. He also reminded that this was not an issue and reminded to sample any tea before I make a purchase regardless of the wrapper condition. I like this tea. The medicinal herbs taste is very pronounced. Quite addictive. Did the tea stains affected the tea in any way? I do not know. This was a tea cake that I finished in 2 months and I am already on my second cake.